Send us your new product and company press releases. The cold winds of autumn blows and much needed rain drops fall, yet you, my ruby friend, delay your departure to the safe haven of your winter home to the south. As I sit down to my Saturday morning coffee, you cease your constant fluttering flight to rest a moment on the copper swing I've put out for you this summer, just outside my window. Today's ride for you is rougher than the gentle breezes of a Missouri summer, as the incoming storm causes cold, blustery winds and rain to ruffle your coat of feathers. As drops of rain fall on you little feathered friend, do know as you travel south I'll always cherish the memories you and your offspring and friends provided for me this summer of 2013. I fear, however, I and others take for granted the countless tens of thousands of trips you've taken to and from the feeders I've placed on my deck and windows for you. I'll never forget how God blessed me when you and your friends were so kind to come and feed from my hand as my grandson, Eli, and I sat on the deck praying you would come to our small offering of nectar. Even as Eli excitedly yelled "turd, turds", as he hasn't mastered the "B" sound yet, you thrilled us with your rapid flights and constant chattering as you fed nearby. Those memories with Eli and you are among the most cherished of my life on this Earth. I thank you so much. Suddenly, a strong, cold gust of wind blows and you are gone. My swing rocks back and forth - empty - but my memories of you and the joys you provided for me in the summer of 2013 will live forever. I ask God that you have safe journeys, my friend and perhaps we'll chat again next spring as you and yours come to my windows and say - "we're back and we're hungry." My parting prayer is that I and others will remember even more and take time to enjoy what I write at the close of each of my e-mails: "Nature is a stress reliever from God, Take Time Today to Listen to the Birds Sing." Travel safe my friend and know I will cherish and remember our moments together as long as I live! Or check out Mel's comments on You Tube. 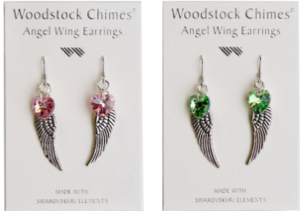 SHOKAN, N.Y., October 2013 -- Woodstock Chimes, a leading manufacturer of musically-tuned windchimes, has tossed its hat into the fashion accessories arena with a new line of Rainbow Makers – Angel Wing Earrings. Woodstock’s Rainbow Makers Collection, comprised of genuine Austrian crystal ornamental products, has quickly become a top-seller for the company, since its winter 2011 debut. The Angel Wing Earrings are offered in six different color Swarovski Elements Crystal Hearts, which are set atop antiqued-finish, lead-free pewter angel wings. Each pair includes sterling silver ear wires with stops, and retails for $20. This mid-season launch offers shipping just in time for the holiday season, with pre-Thanksgiving delivery for orders placed by Friday, November 8, 2013. The entire line can also be seen during the upcoming winter 2014 show season in Atlanta, Dallas, Las Vegas and most regional shows. “With Rainbow Makers continuing to fly off our retailers’ shelves, we chose to expand the line by utilizing these exquisite Swarovski Elements Crystal Hearts in an unexpected, but fashion-forward way. The Angel Wing Earrings achieve just that,” said Garry Kvistad, founder and owner of Woodstock Chimes. Designed and made in England, each pair of earrings come on a self-standing card for easy displaying, and are packaged in an organza bag for gift giving. The earrings are sure to appeal to all fashionistas, with its six different designer colored crystals: Aurora Borealis, Peridot, Blue Zircon, Light Rose, Aquamarine and Violet. An easy reorder assortment, with one pair of each color, is also available for $60 (CWASMT). For details about Woodstock Rainbow Makers – Angel Wing Earrings, the complete Woodstock Chimes and Woodstock Music Collection® product lines, or for a current trade show listing, please visit www.WoodstockChimes.com. Grand Rapids, Mich. (October 2013) - The Gift and Home Trade Association (GHTA), whose mission is to support, lead, and unify the gift and home industry, focusing on its long term success, confirmed its 2013-2014 Board of Directors during the 11th Annual GHTA Conference, held October 2-5 in San Diego, California. The GHTA’s executive board is as follows: John Keiser of OneCoast, chairman of the board; Todd Litzman of Brandwise, president; Bob Ricciardi of About Face Designs, vice president; Joe Harris of Whereoware, treasurer; and Cindy Henry of Wellspring, secretary. Additionally, the GHTA has added several new members to its board, each of whom bring a wealth of talent and experience to the organization: Dan Loughman of Roman Inc., Dylan Schauben of J.Grob & Associates, George Kacic of Giftcraft, and Cliff Price of Cliff Price & Company. Continuing their board terms are Fred Schmidt of All for Color, Randy Spoor of Center Stage Team, Lisa Wohlhart of Ivystone Group, and Allison Barrows of Ganz. Chad Corzine of Archipelago Botanicals and Julie Dix of FalconBlue were named ex-officio board members. Andy Bjork of Ivystone Group will continue as parliamentarian. To learn more about the Gift and Home Trade Association, please call 877.600.4872 or visit www.giftandhome.org. 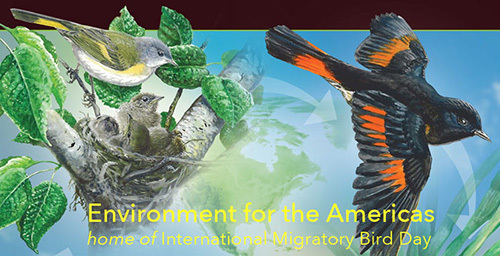 International Migratory Bird Day programs and events have more than tripled in the Caribbean, Mexico, Honduras, and Colombia, thanks to the work of a team of coordinators. Coordinators are responsible for recruiting new sites, communicating with event organizers, and hosting their own activities. All of the coordinators work as both biologists and educators in their countries and have considerable knowledge to share with partners and participants. Over 30 organizations are hosting fall programs that highlight the importance of non-breeding grounds to the survival of migratory birds. From left to right are Sheylda Díaz (Puerto Rico), Anthony Levesque (Guadeloupe), Juan Pablo Medina (Mexico), Fabiola Rodriguez (Honduras), Alejandro Pinto (Colombia), and Ingrid Flores (Puerto Rico). Not pictured is Rafael Cruz (Mexico). Thanks to all! IMBD 2014 focuses on the ecosystem services birds provide, from pest control to seed dispersal and pollination. The art will feature 9 species of birds selected by YOU. These include Great Egret, Turkey Vulture, and American Robin. At the 2013 meeting of the American Ornithologists' Union, EFTA Board Member Russ Greenberg was presented with the Elliott Coues Award. Named for one of the great pioneers of American ornithology, the Coues Award recognizes outstanding and innovative contributions to ornithological research. And it's a very big deal. Russ is a phenomenal ornithologist, and his deep and extensive knowledge gave International Migratory Bird Day a firm foundation right from the start. In September, 80 friends, former students, and colleagues, including EFTA, gathered in Maryland for the Greenberg Innovations Sessions to honor Russ's deep and broad academic legacy. This warm and rich event featured presentations on current avian research, food, and festivities. Congratulations to Russ and our appreciation for his contributions to Environment for the Americas! Visit the Environment for the America's Web site for information on all of their programs. 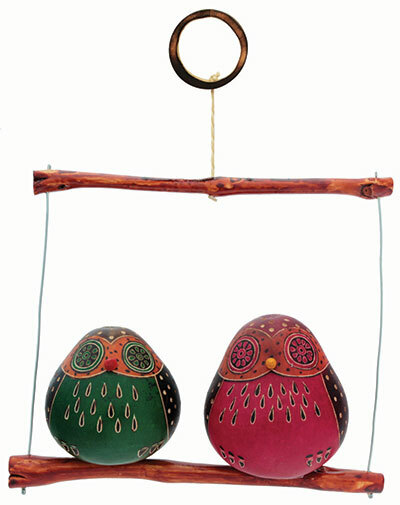 Droll Yankees’ Onyx Clever Clean bird feeders, known for their removable bases and contemporary lines, have a new model featuring patented Magnet Mesh that is more attractive to finches. 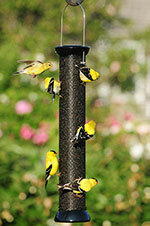 PLAINFIELD, CT (PRWEB) July 01, 2013 -- Finches are flocking birds that will feed together in harmony. 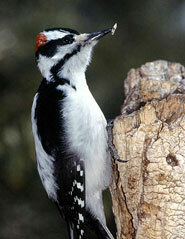 When greater access to the seed is provided more birds visit the feeder. Droll Yankees’ new Onyx Clever Clean Finch Magnetfeatures a mesh feed tube with 50 openings per square inch to dispense Nyjer® seed and nyjer mixes. The diamond-shaped openings of the patented mesh align with the direction of the seed in the feeder. The benefit of this alignment became clear when Dr. Aelred Geis’s controlled studies showed that the use of this mesh resulted in 68% more bird visits when compared to screen-type nyjer feeders. With 50 openings per square inch, the 18″ Finch Magnet has over 1800 access points when the feeder is full. More access, more finches! The finches easily cling to the mesh without the need for perch rods. The new Finch Magnet comes in two sizes; the 12” version (CC12FM) holds one pound of Nyjer® or a nyjer mix. For greater capacity and more birds, the 18” model (CC18FM) holds almost 2 pounds of seed. 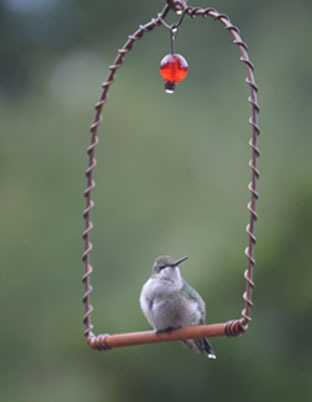 Droll Yankees’ Onyx Clever Clean line of bird feeders derive their name from the “twist and release” feeder base that allows for the removal of any chaff, debris, or clogged seed ports quickly and easily before each refill of the feeder. Also, by removing the base, feeder tubes can be accessed from either the bottom up – or the top down – allowing for a simple scrubbing with a Bird Feeder Brush(BFB). To attract even more finches, Clever Clean Seed Trays (CCT, CCT-S) can be attached to the base of any Onyx feeder to catch dropped seed. The trays conveniently stay attached when the base is removed for cleaning. Look for Onyx Clever Clean products at your local retailer, call Droll Yankees at 888-851-6621, or shop online at www.drollyankees.com. Like most Droll Yankees products, the Onyx Clever Clean line is made in the U.S.A.